Work to bring Quentin Tarantino's vision for Star Trek 4 to life seems to be continuing apace, with Deadline now reporting the film has signed up a writer, Mark L. Smith. 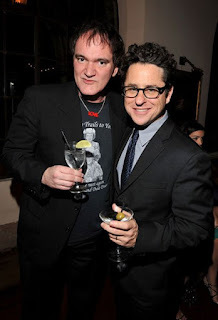 After a writers room exercise, it seems Smith was picked out of several candidates, and will now write the film while Tarantino is busy on his current project - Deadline's latest report suggest Tarantino remains keen to direct the Star Trek film too. Best known for the gritty western, The Revenant, it is perhaps not a coincidence that Smith's next film, Overload (due next year), is being produced by J.J. Abrams, Bad Robot, and Paramount. Previous films generally have a horror bent, including Vacancy, and Martyrs. Which is maybe fitting, given Deadline also report Paramount have oked the Tarantino Trek film to be R-rated. This could mean a bit of profanity being thrown around the bridge, more explicit violence, or sexual content. Which would all be fairly new to the generally not so edgy (in that regard) Star Trek universe - We might find ourselves with Kirk declaring something a little stronger than "double dumbass"! People are always saying to me, 'Will you be Jean-Luc Picard again?' And I cannot think that would be possible, but there are ways in which something like that might come about. But one of my dreams is to work with Tarantino. I admire his work so much, and to be in a Tarantino film would give me so much satisfaction. So, if he is going to direct something to do with Star Trek and there was the possibility of dear old Jean-Luc showing up again and doing that for Mr Tarantino, I would embrace it. Isn't it Star Trek 14?